We steadfastly pursue intellectual, spiritual and personal growth, reflecting our belief in the wonder, excitement and joy of discovery along life’s good journey. Central to that journey is an appreciation for the best that has been thought, written and discovered throughout history, and we intend to add to that body of knowledge, sharing the adventure of inquiry in an atmosphere of academic freedom, both within and outside the classroom. We believe in an inclusive community that values diversity and considers it a strength. We foster and celebrate practices that nurture living and learning in an atmosphere of caring, respect and mutual accountability. We seek to enhance the quality of life in the world around us, particularly by reaching out to the poor, the less fortunate and the disadvantaged. We demonstrate this spirit of community on our campus and wherever we are. At the core of our identity is a strong belief in the goodness of life and the God-given worth of every individual. We treat all members of our community with dignity and strive to help them reach their full potential. We commit ourselves to actions that empower all members of the St. Bonaventure community and encourage participation among all students, staff and faculty in creating our future. 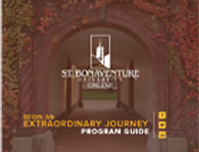 At St. Bonaventure University Online, we foster the development of knowledgeable, skilled, compassionate and ethical individuals by mentoring students within vital and engaging learning environments and being ever mindful of Franciscan values, including individual dignity, community inclusiveness and service to others.